As a benefit of your Office 365 Home or Office 365 Personal subscription, you can create a personalized email address that's associated with your Outlook.com mailbox. To get started, sign in to https://outlook.live.com and make sure you're using the new Mail experience. Select the diamond icon on the toolbar to open the premium dashboard. Under Personalized email address, select Get started and follow the instructions. If you have an Office 365 Home subscription, people you've shared the subscription with can also set up a personalized email address with your connected domain. After you've set up your domain, people you've shared with will see an option to add a personalized email address. Who can set up a personalized email address? Subscribers to Office 365 Home or Office 365 Personal are eligible to set up a personalized email address. Note that setup isn't available when you're using a mobile web browser. Is there an additional charge for setting up a personalized email address? If you don't already own a domain, you'll need to purchase a new one from GoDaddy. New domains typically cost between $5 and $25 per year. You will pay for your domain directly with GoDaddy. What happens to my personalized email address if I cancel my Office 365 subscription? If you cancel your Office 365 subscription, you will no longer be able to send or receive email with Outlook.com using your personalized email address. However, you won't lose any existing email. 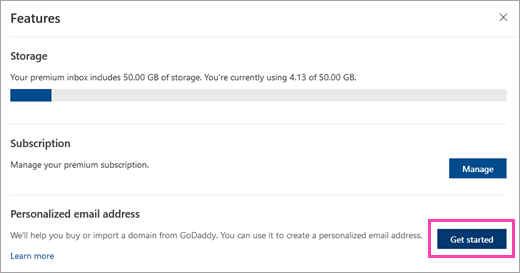 As long as you continue to pay for your domain with GoDaddy, you can always reactivate your personalized email address by re-subscribing to Office 365 and going to Settings > Premium > Features and selecting Get started. What happens to my personalized email address if I cancel my domain with GoDaddy? If you cancel your domain with GoDaddy, you will no longer be able to send or receive email with Outlook.com using your personalized email address. However, you won't lose any existing email. You own your domain and GoDaddy is the registrar that manages it for you. You can set up a website with your domain or transfer it to another registrar if you prefer. However, if you transfer your domain away from GoDaddy, you will no longer be able to send or receive email with Outlook.com using your personalized email address. I already own a domain that's registered with a provider other than GoDaddy. Can I set up a personalized email address in Outlook.com? At the moment, we only support connecting domains managed by GoDaddy with Outlook.com. Can I share my domain with others so they can also have personalized email addresses? If you have an Office 365 Home subscription and a domain connected to Outlook.com, the other people that you've shared the subscription with can set up their own personalized email addresses using your domain. If you remove your domain from Outlook.com, cancel your Office 365 Home subscription, or remove a person from your Office 365 Home sharing group, that person will lose the ability to send and receive email with their personalized email address. No, this isn't supported. If you want to create multiple aliases on a single mailbox with your domain, we suggest purchasing an Office 365 Business Essentials subscription. Can I use my new personalized email address to sign in to Microsoft services like Outlook.com or my Office 365 subscription? No. We strongly recommend against setting your personalized email address as your primary alias for signing in. Doing this can create problems with signing in or even sending and receiving email. You can still set your personalized email address as your default "From" address by going to Settings > Mail > Sync email. I have a commercial Office 365 subscription. Can I use the custom domain tied to my commercial email account as a personalized email address on Outlook.com? No. You can't use the same email address for a commercial Office 365 email account and a consumer Office 365 or Outlook.com account. I started, but did not complete, the setup process. How do I set up my personalized email address? Go to Settings > Premium > Personalized email address and check the status of your domain. If there is no Personalized email address tab, it means GoDaddy did not successfully connect your domain to Outlook.com. Go to Settings > Premium > Features and select Get started. Select the I already own a GoDaddy domain option and follow the steps in the process. If the status bar is yellow, you just need to select Create Address and finish setting up your personalized email address. First, you need to remove the domain from Outlook.com before trying again. Select the Cancel setup button. Refresh your browser, then go to Settings > Premium > Features and select Get started. If the status is grey, GoDaddy is still configuring your domain. Check back in a few hours. The status should change to green or yellow. If, after 24 hours, the status is grey or red, select Cancel setup to try reconnecting. After selecting Cancel setup, refresh your browser window. Then go to Premium > Features and select Get started. I received an error message that says "Sorry, that address is already in use. Please choose a different name." If your personalized email address was listed as your primary alias, you should first make an @outlook.com email address your primary alias, then select Remove next to your personalized email address. If your personalized email address wasn't listed as your primary alias, select Remove next to that address. After you complete the preceding steps, go back to your inbox and select Settings > Mail > Sync email. Make sure your personalized email address is no longer listed under Set default From address. Then follow the personalized email address setup process. The error should no longer appear. If you've completed steps 1-3 and are still seeing this error, go to https://outlook.live.com, sign in, and enter the personalized email address you want to use. If you're prompted to enter a password, it means that the address is tied to a different Microsoft account. Sign out of the account. Then sign back in, complete any required verification steps, and make sure that you can still send and receive email on this account with an address that's not your personalized email address. You should also make sure that your personalized email address is no longer listed as an available From address on this account. Finally, sign in to the account you'd like to use with your personalized email address and complete the setup process. The error should no longer appear. I'm still unable to set up a personalized email address. Go to https://account.live.com/names/Manage. If you currently have more than 10 aliases tied to your Microsoft account, you'll need to remove some before you can add a personalized email address. Go to https://account.microsoft.com/securityand select UPDATE INFO. If the alias you're trying to add is currently listed on the page, you'll need to replace it with a different address before you can finish creating your personalized email address. If the account you're trying to create a personalized email address for belongs to a child, you may not be able to complete the process. We're working on a solution for this issue. I'm trying to remove my domain or personalized email address but it's not working. Go to https://account.live.com/names/Manage and make sure that your personalized email address isn't set as your primary alias. I'm trying to add my GoDaddy domain but get an error message that says "Your domain does not appear to be managed by GoDaddy." My personalized email address is not receiving or sending mail (or I don't see it or can't sign in with it). Go to https://outlook.live.com and make sure you are using the new Mail experience. Select the diamond icon on the toolbar to open the premium dashboard. If you don't see a diamond icon in your inbox (and you do see ads), it means your Office 365 subscription has expired. Go to https://account.microsoft.com/services to re-activate your subscription, then reconnect your domain using the steps in "Get started". If you don't see a "Personalized email address" tab underneath "Features" and "Security", it means your personalized email address was removed from Outlook. If you originally set up the domain, your Office 365 Home subscription likely expired. Go to https://account.microsoft.com/services to re-activate your subscription, then reconnect your domain using the steps in "Get started". If someone shared an Office 365 Home subscription with you, their subscription may have expired or they may have removed the domain from Outlook. Contact the owner of the Office 365 Home subscription and ask them to reconnect the domain. If the "Personalized email address" tab has a red status bar, your domain may have expired. Confirm with GoDaddy that your domain is still active. If your domain is active with GoDaddy, select Cancel setup and refresh your browser window. Then go to Premium > Features and select Get started.